In this edition of Meet the Artist, Uzorka displays and discusses his recent body of work that includes 'Where were you when I was here?' and 'It feels strange to pay for Nigerian Food' both of which are products of his residency at the Iwalewa Haus, Bayreuth and Savvy Contemporary, Berlin respectively. 'Where were you when I was here?' is an umbrella theme of Uche Uzorka’s departure from the general topic. He focuses on the simultaneous presence and absence of contemporary African art within and outside the African continent. This body of work was achieved through the process of cutting up images that represent works stored in the Iwalewa-Haus archive; works that are familiar, yet disconnected from their origins. In doing so, he hopes to raise questions related not only to our daily relationship with and consumption of archived art, but also to the problem faced in Nigeria and in many countries where access to original works is often times limited. 'It felt strange to pay for Nigerian food' explores alienation, inclusion and the external perception of a subject. by addressing anonymous authorship and the free archive that the web represents. Uzorka worked with phrases and search captions on Internet search engines relying entirely on the Internet for information about his chosen subject, Nigeria. By employing image re-presentation through shredding, the images gain a new form and meaning when grouped into smaller, more manageable quantities. The idea, simple as it is, was to process images in multiples of small units and store them in bags and sachets for visual presentation. Uche Uzorka is a mixed media artist who lives and works in Lagos, Nigeria. Uzorka was born in 1974 in Delta State, Nigeria, and graduated in 2001 from the University of Nigeria, Nsukka, majoring in painting. Uche’s practice incorporates painting, collage, cutting and pasting, charcoal, and ink drawing in an examination of processes of urban street culture. Uche won first place in the National Art Competition in 2011 for his collaboration with artist Chike Obeagu. 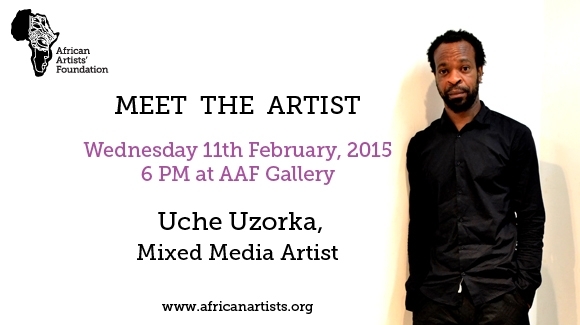 His first solo exhibition, Uche Uzorka: The Organic, was held in October 2012 at the Goethe-Institut Nigeria in association with African Artists’ Foundation. Line.Sign.Symbol, Uche’s second solo exhibition, was held at the African Artists’ Foundation in January 2013.